Den Dekker enters his first season with Long Island and 10th in professional baseball. 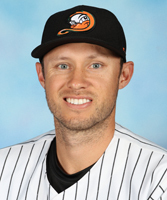 The outfielder spent six seasons in the Major Leagues from 2013-18, playing with the New York Mets (2013-14, 2018), Washington Nationals (2015-16) and Detroit Tigers (2017). He combined to appear in 166 games, totaling seven home runs, 30 RBIs, 46 runs, 82 hits, 19 doubles and 12 stolen bases. Defensively, the Fort Lauderdale, Fla. native committed just two errors over 129 games played in the outfield, accruing a .990 fielding percentage. Den Dekker’s first MLB hit was an RBI single off Nationals pitcher Dan Haren on August 31, 2013. His first big league home run came one day later off Ross Ohlendorf. The 31-year-old played eight games with the Mets in 2018 but spent the majority of the season at Triple-A Las Vegas. In 87 games with the 51s, he compiled a .278 batting average with 14 homers, 44 RBIs, 52 runs, 19 doubles, five triples and eight stolen bases. The University of Florida alum has played in 881 minor league games during his pro career, hitting at a .271 clip with 86 homers, 401 RBIs, 487 runs, 806 hits, 181 doubles, 42 triples and 112 stolen bases. Den Dekker was originally selected by the Mets in the fifth round of the 2010 amateur draft.